Multi award winning Ocean Rafting visits the “Wild Side” of the Whitsunday Islands, the uninhabited islands with beautiful natural scenery brimming with marine, bird and animal life. There are two exciting tour options, the Northern Exposure and Southern Lights. 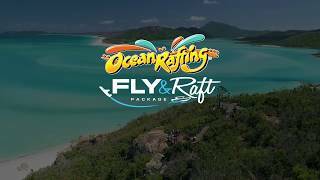 Each Ocean Rafting day offers three days in one, including an exhilarating ride to Whitehaven Beach and Hill Inlet, pristine snorkelling reefs and guided Whitsunday Island National Parks walks. 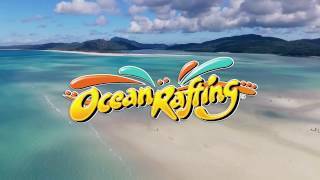 Ocean Rafting offers the ultimate access to the stunning and iconic Hill Inlet beach and special snorkel sites at Hook Island and Border Island ensure a memorable underwater experience, with special permits allowing the vessels to visit protected areas in the Great Barrier Reef Marine Park. 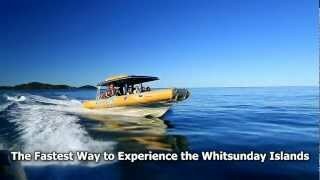 The semi rigid inflatable vessels are super fast allowing guests to experience a fun ride, adventure and education amongst the natural beauty of the Whitsundays. 32 passengers at most allows for personal snorkelling lessons and the pleasure of a small group. An optional buffet style lunch is served at the beach with plenty of time to swim in the turquoise ocean or just relax on the silica white sand. Tours depart from Abell Point Marina North and courtesy coach pickups are included. Enjoy the best of the Whitsunday Islands and Great Barrier Reef in one day with a 60 minute Whitsunday scenic flight and Ocean Rafting adventure! Experience the Whitsundays’ ultimate destinations - Heart Reef, Whitehaven Beach, Hill Inlet and secret snorkelling locations. See the Whitsundays from above with a stunning scenic flight over the islands and Great Barrier Reef, including famous Heart Reef and Whitehaven Beach, then ride the tropical waters on Ocean Rafting’s Southern Lights or Northern Exposure tour. Enjoy a bird’s eye view of many of the 74 Whitsunday Islands, fly over Whitehaven Beach and picture postcard Hill Inlet before heading out to the Great Barrier Reef and experiencing one of the most photographed reef locations, Heart Reef. The comfortable fixed wing aircraft offers big window viewing, pilot commentary and the best views of the Whitsundays! Following your flight, enjoy an Ocean Rafting adventure, offering three days in one, including an exhilarating ride to Whitehaven Beach and Hill Inlet, pristine snorkelling reefs and guided Whitsunday Island National Parks walks. 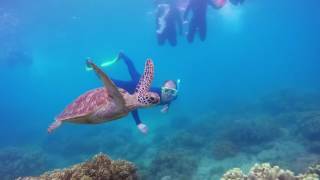 The Southern Lights tour offers more beach time and the Northern Exposure tour offers more snorkelling time. The best view from above, on and below the water in the Whitsundays!